Can A Fruit Fly Help Explain Autism? : Shots - Health News Scientists hope to solve mysteries of the human brain by studying much simpler neural networks — like the brain circuits of fruit flies and mice. Already such research is turning up clues to why many people with autism are easily overwhelmed by bright lights and loud sound. For President Obama, 2013 wasn't just the year of Obamacare. It was also the year of the brain. In April, Obama announced his Brain Research through Advancing Innovative Neurotechnologies (BRAIN) Initiative — an effort to unlock "the mystery of the three pounds of matter that sits between our ears." But scientists say that in order to explain the human brain, they'll have to learn a lot more about much smaller and simpler brains, like those in mice and insects and worms. "What you need is access to circuits and cells, and that probably means not in humans," says professor Leslie Tolbert of the University of Arizona neuroscience department. For example, scientists are using fruit flies to figure out why many people with autism are easily overwhelmed by loud sounds, bright lights, strong odors or simply being touched. Rachel Wilson, a neurobiologist at Harvard, suspected that this sensory overload might be caused by a malfunction in brain circuits that adjust the "volume" of sensory signals. But there's no easy way to study that in people. So she turned to fruit flies, which use a similar volume-control system to process odors. 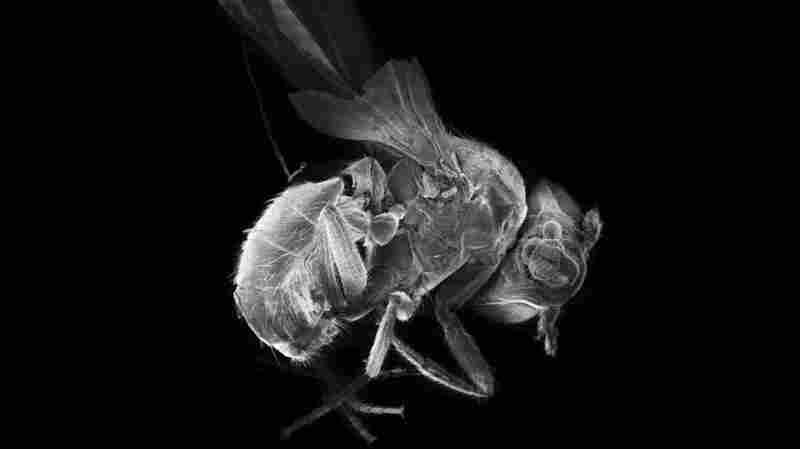 By genetically manipulating the flies, Wilson discovered special brain circuits that work like the gas and brake pedals in a car; she reported her findings at this year's Society for Neuroscience meeting. When odors are very faint, she says, "the gas dominates," making the brain more sensitive. "But when odors are intense, then it's the brakes that dominate," reducing sensitivity and preventing the olfactory system from being overwhelmed. That's probably how sensory volume control works in many species, including people, Wilson says. And now that autism researchers know what to look for, they should have a better chance, she says, of figuring out why many people with the disorder are easily overwhelmed by bright lights or loud sounds. Of course fruit flies are best suited for studying very basic functions in the human brain. For more complicated stuff, scientists need more complicated animals, like mice. And mice are helping researchers understand how the human brain learns to see the world in three dimensions. It's not something we're born with, says UCLA's Joshua Trachtenberg. He says three-dimensional vision emerges during the first two years of life or so. That's when the brain learns to combine the information from our two eyes to give us depth perception. Normally the brain can learn this only during a critical period early in life. So children with certain vision problems that aren't corrected early never learn to see in 3-D. But Trachtenberg was part of a team that found a way to reawaken the brain's ability to acquire 3-D vision. They did it by first identifying a group of cells in the mouse brain that control visual plasticity, also known as visual learning. Then they found out how to turn these cells on and off with drugs. "We were able to go to fully adult animals that don't normally have this kind of plasticity, and turn it back on," Trachtenberg says. That means it should be possible to give people who never developed 3-D vision a second chance to acquire it, he says. And knowing how to restore areas of the brain to a youthful learning state could be useful in treating a wide range of other problems, from ADHD to perhaps even schizophrenia, Trachtenberg says. "Once we understand [the brain] at this most basic level," he says, "we can manipulate the system to make the lives of people better. That's really the goal of the BRAIN Initiative."